We’d love your help. 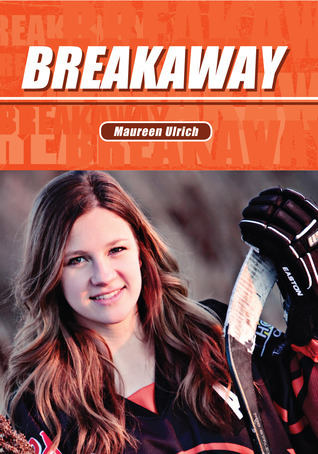 Let us know what’s wrong with this preview of Breakaway by Maureen Ulrich. To ask other readers questions about Breakaway, please sign up. The final book in the Jessie Mac series was my favorite of the three, but again, the three feel so linked to me (perhaps just because I read them so quickly, all in a row!) that I’m not sure if this is a review of the book or the series. Jessie is now seventeen, and this girl is miles away from the fourteen-year-old in the first book. She is mature, sensible, considerate, and passionate about hockey. She worries about nutrition and staying in shape for games. All this is a pleasure precisely bec The final book in the Jessie Mac series was my favorite of the three, but again, the three feel so linked to me (perhaps just because I read them so quickly, all in a row!) that I’m not sure if this is a review of the book or the series. Jessie is now seventeen, and this girl is miles away from the fourteen-year-old in the first book. She is mature, sensible, considerate, and passionate about hockey. She worries about nutrition and staying in shape for games. All this is a pleasure precisely because I met her as such a troubled and self-centered younger teen. However, she is not above making bad choices, such as going out with a guy she doesn’t really care about, because he feels safe. I would definitely recommend reading the two previous books before reading this one. There is a lot going on, and I’m not sure how much sense it would make or how emotionally resonant it would be without the background. The book steers clear of every cliché minefield and offers no simple resolutions. Given the schmaltzy nature of a lot of YA romance, I really appreciated the complicated realism of the relationship arcs. This is a story about a girl growing up, and while dating is a part of it, like friends and like hockey, it isn’t central, and nothing ever works out storybook-perfectly. Jessie’s hockey successes are satisfying and allow us to hope for her future, but again there is never a defying-all-odds miraculous victory. They win and they lose, and their tangled lives and friendships are part of the game they play. I failed to mention in the previous two reviews, also, just how funny these books are. There are some great one-liners, and a lot of wonderful locker-room scenes. I'm a fan of local authors so this book was a treat to read as were the others in the series. Living in Estevan, most of the characters I can picture. A great series for young readers with timely topics covered. Fun, girly hockey story for teens, with a healthy dose of high school drama. Full review to come in Quill & Quire.